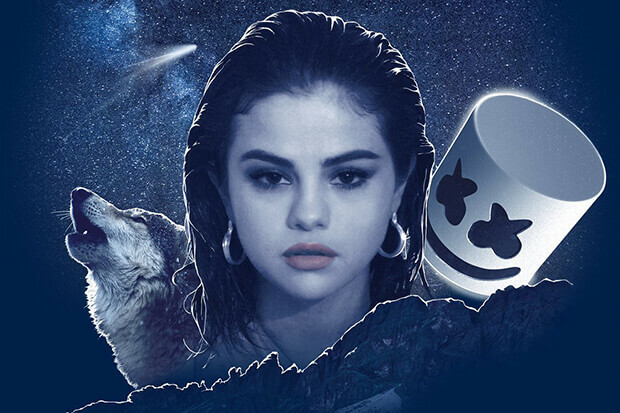 Selena Gomez & Marshmello Strike Gold With "Wolves"
Selena Gomez reveals how her new collab with DJ Marshmello came together. Selena Gomez has an impressive track record with club collaborations, lending her voice to Zedd’s perky “I Want You To Know” and Cashmere Cat’s extremely-underrated “Trust Nobody” as well as chart-conquering smash “It Ain’t Me.” That track with Kygo went top 10 on the Billboard Hot 100 and has racked up more than 500 million streams — statistics that aren’t out of the realm of possibility for “Wolves.” The pop star’s collab with Marshmello dropped this morning (October 25) and it’s an unashamedly romantic anthem with an instantly catchy chorus. “Wolves,” which is equal parts acoustic-laced EDM and long, lost ’80s pop song, is Selena’s first single since undergoing a kidney transplant, which stopped her from promoting summer songs “Bad Liar” and “Fetish.” It will be interesting to see if her health allows any TV performances. There’s a cute, DIY video coming to Spotify — so that’s a good start. Listen to the future hit below.